I love books. If you know me or you’ve been in my office, this will come as no surprise. I love the idea of “books,” the reading and learning - but I also love books per se. Physical, tangible books. No eBooks or digital copies here. If I could get a car air-freshener in “New Book Scent,” I would. Maybe it’s because I’ve built my life around a Book. Or because God wants us to glorify Him with our minds, too. Or maybe because I’m just weird. But whatever my reason, there’s something about reading and learning and devouring books that seems right for Christians - and especially pastors. God has preserved His words in the form of a book. Therefore, pastors are vocationally readers. They go to meetings to plan and strategize, they visit with people, they counsel people spiritually, and they cast vision and make budgets - but none of that matters if they are not devoted to the ministry of the Word (Acts 6.1-7). The Church spreads by proclamation of the Word, the gospel message that Jesus Christ saves sinners. Pastors (and Christians) are better served when they are readers, reading the Bible to hear from the Lord, but also seeking wisdom by reading commentary and books written by the godly who’ve gone before us. So what's one book that's made a huge impact on me? 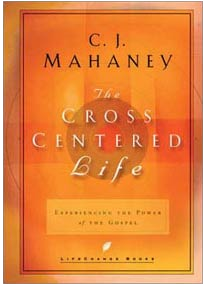 The Cross Centered Life by CJ Mahaney. This book is all about the gospel and its importance in our day-to-day everything we do. So often we slip into this mentality where the gospel is just something that unbelievers need to hear to be saved. And no one does it on purpose. Do’s and don’ts and lots of other things lull us into thinking that the gospel belongs in a tract for the lost, but it really doesn’t have anything to offer us after we get saved. Mahaney argues just the contrary - that the gospel is in every way for the believer after their conversion, and that daily reminding ourselves of the cross can transform our lives one day at a time. He writes about why we need to be reminded of the gospel daily, but he doesn’t leave us hanging. He also devotes time at the end of the book to how we can do it - simple ways to put into practice the cross centered life. Weighing in at only 96 pages, this short book can be read in one sitting. I know. I’ve done it. But that was the second time I read it. When I put this book down after the first time, I immediately knew it was one that I would come back to regularly. And I encourage you to read it, too. After all, we can never have too much exposure to the gospel of Jesus!